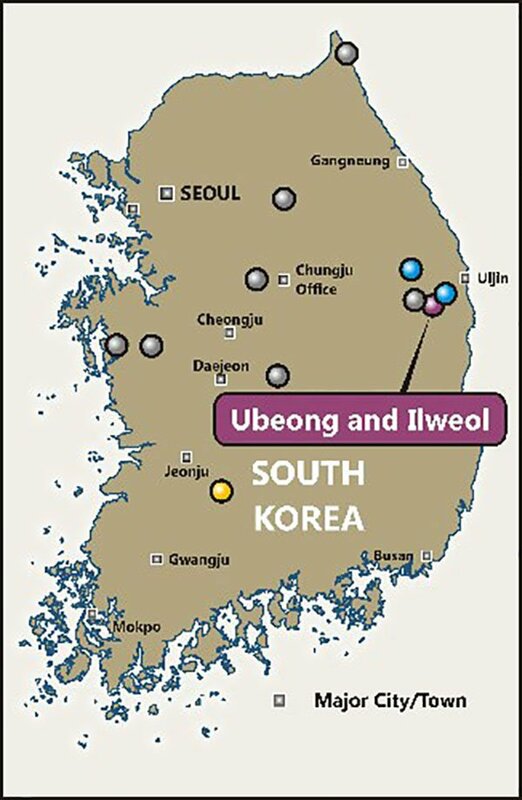 Peninsula Mines (ASX:PSM) has achieved a significant milestone at its flagship Ubeong metals Project in South Korea. PSM reports that its recent drilling campaign has intersected two significant sulphide zones which closely correlate to PSM’s previously-identified target zones — Taipan and Cobra. PSM is advancing a highly prospective zinc-lead-silver and copper-gold project in South Korea and also has a dual focus on advancing a series of flake-graphite projects. PSM intends to register metals and graphite resources in South Korea, that offer potential to be advanced and developed to supply high technology, lithium-ion battery and/or expandable graphite applications for which South Korea is the major global end-user. PSM reports that a shallow angle drill hole, UBD0002, has intersected a 90m zone from 25.9m of skarnified limestone with variably disseminated sulphides including “blebs” of sphalerite (Zn), patches of arsenopyrite (silver association) and trace galena (Pb) through the Taipan target zone. The drillhole, UBD0002, then intersected a zone of difficult drilling in pelitic sedimentary rocks before intersecting a 3.6m quartz-sulphide (coarse arsenopyrite) lode from 337.6m in the Cobra target zone. Of course, as with all minerals exploration, success is not guaranteed – consider your own personal circumstances before investing, and seek professional financial advice. 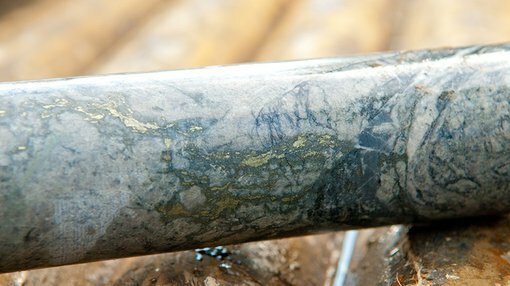 When subjected to XRF testing, PSM’s samples indicate observed results of up to 931 g/t silver (associated with coarse arsenopyrite), and on the northern side of the lode, up to 0.28% zinc and 0.46% copper. Hand-held XRF readings are only an indication of mineralisation, and not necessarily substantive of anything. To clarify the extent of PMS’s grade and quality, PSM has now commenced a full elemental analysis with ALS Global in Perth. 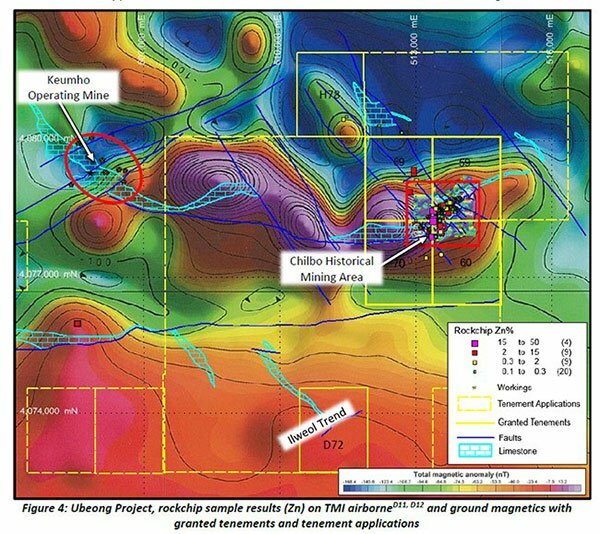 The high-grade zinc-lead-silver and copper-gold rock chip samples extracted from the Chilbo workings area are “associated with an extensively faulted zone that has offset the unit and is interpreted to have acted as a conduit for mineralisation”. Moving forward, PSM expects the next hole (UBD0003), to be drilled within the coming days, testing tow coincidental electromagnetic (EM) and Induced Polarisation (IP) chargeability anomalies. Detailed analysis of the samples collected indicated several portions of Ubeong’s mineralisation is being obscured by colluvial scree at the base of the valley. PSM has secured six granted tenements and multiple tenement applications over the eastern ten kilometre strike length of a highly prospective, limestone-skarn unit that includes the historical Chilbo mine workings and adjoins the operating Keumho Zinc-Lead-Silver Mine. Tenements and applications have also been secured over a southern trend of workings at Ilweol.